You can prepare an expertly cooked beef tenderloin in the oven or on the grill. Beef tenderloin is prized for its exceptionally tender texture, so it's no wonder it's commonly served at special occasions. 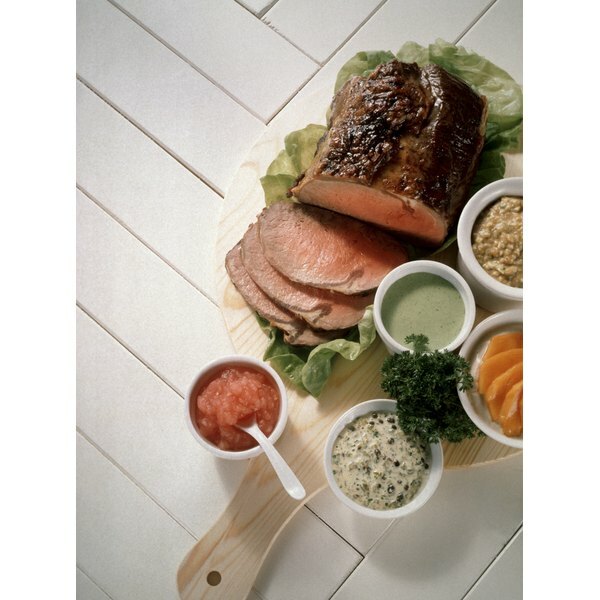 A whole beef tenderloin trimmed of excess fat weighs in at around 5 pounds, making it ideally suited for large feasts. This famously moist and mild-tasting cut is most often roasted in the oven, but you can achieve similar results on the grill. Tenderloin is wonderful seasoned simply with salt and pepper, but you can infuse the meat with an extra burst of flavor by rubbing the exterior with dried herbs and spices like garlic powder, onion powder, parsley, thyme or sage. Heat a large skillet, preferably cast-iron, over medium-high heat with a few tablespoons of olive oil. Blot the tenderloin dry and sprinkle liberally with salt and pepper. Drying the surface encourages the meat to develop a caramelized crust. If the tenderloin is too long to fit into the skillet, cut it in half into two equal portions. Add the beef to the skillet and cook until it is nicely browned on all sides, about 4 minutes per side. Transfer the tenderloins to a roasting pan with a rack. Roast the beef until it reaches your desired level of done-ness. Aim for 120 F for medium-rare, about 20 minutes; or 130 F for medium, about 25 minutes. Due to its lack of fat, beef tenderloin cooked above medium tends to become dry and tough. Remove the tenderloin from the oven and allow it to rest for 10 to 15 minutes before slicing. Resting helps the meat retain its juices as the internal temperature continues to rise about 5 to 10 degrees. Prepare your grill for indirect cooking over medium-high heat. For propane grills, set half the burners to medium-high. For charcoal grills, pile the coals on one side and light them until they just become gray with ash. Clean the grill grates and lightly oil them to prevent the meat from sticking. Brush the tenderloin with oil and season generously with salt and pepper. Place the tenderloin on the hot side of the grill and sear until nicely browned, about 2 minutes per side. Transfer the tenderloin to the cooler side of the grill. Cover the grill. Allow the tenderloin to cook until it reaches your desired level of done-ness. It will take about 15 minutes to reach 120 F for medium-rare, and up to 25 minutes to reach 130 F for medium. Remove the tenderloin from the grill and allow it to rest for 10 to 15 minutes before slicing. Ask your butcher to remove the tenderloin's silverskin and any excess fat. To ensure even cooking, tuck the thin, tapered end underneath the tenderloin and tie it in place with kitchen twine. Although most cooks prefer beef tenderloin on the rarer side, the U.S. Department of Agriculture recommends cooking whole cuts of beef to a minimum internal temperature of 145 F to guarantee safety.